Hooray, it’s Wednesday! Just a few short, sweet days left until the weekend. Hulk left on his man-cation to LA yesterday. He’s going to stay with some friends and enjoy not being responsible for small children for a week. My folks are in town visiting Squish (oh, and my siblings and I too I guess) and I’m planning some fun family adventures to Golden Gate Park and the SF Zoo. You know, to see where everyone was eaten by that tiger a few years ago. Typical family activities. My mom and sister went to the store today and got FOOD. Oh sweet Jesus, yes. Last night we feasted on oven-baked tilapia, mashed cauliflour, and green beans. It evaporated off my plate before I could photograph it, I don’t know what happened. Then some champagne and chocolate happened, allegedely. Since there is no photographic evidence on that either, I am not at will to say if said champagne and chocolate occured or not. We all stayed up talking until way past midnight, so I slept in and skipped my workout. My mom made breakfast (score!) 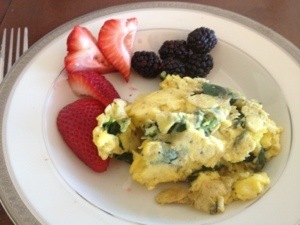 while I got ready – egg and spinach scramble and fresh berries. One of the many awesome things about my folks vising is that they pretty much eat the same way as we do, so meals are a fun, low-stress collaboration. 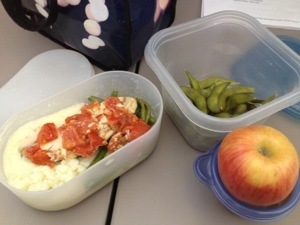 I packed up last night’s leftovers for lunch, along with the last of the edamame, an apple, and some AB. Time to finish up some work, then Mom and I have a date to explore the mega Banana Republic flagship store. Three stories of fashion awesomeness. I may not get a workout in today, but my credit card will. Hope you all are having a most wonderful day! The One Where I Drink Wine and My Mommy Comes to Town! I’m totally excited that the Exploratorium opens next week! I’m sooooo taking my kids. I wanna go shopping 😀 I’m going to wait until April is over as a reward haha. Hope you had a blast! Haha, I should. But I won’t. I’ll do enough shopping for the both of us!